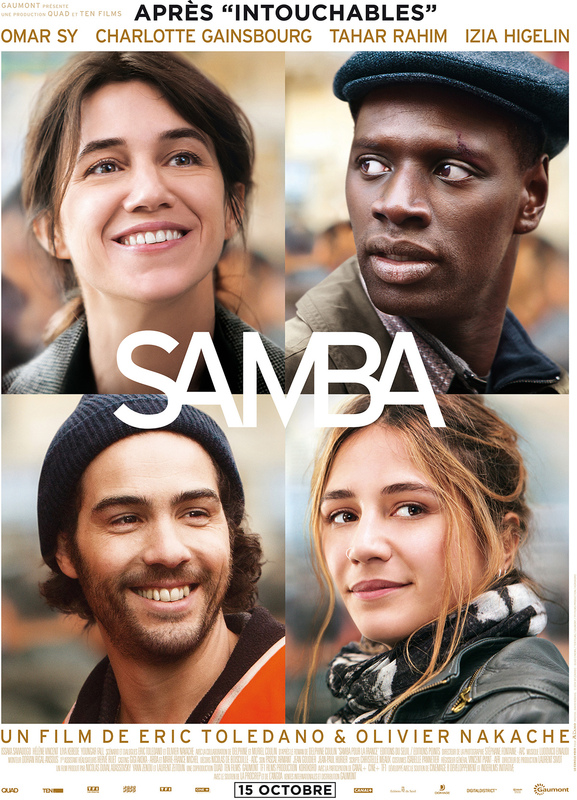 Samba deals with France’s Immigration Policy told through the eyes of Samba Cissé played by Omar Sy. Sy is a big star in France due to his performance in a French Film called the Intouchables. He won the Cesar Award, which is equivalent of France’s best actor, for his role in the Intouchables. That film was directed by Olivier Nakache and Éric Toledano, and Samba was directed by two men also. Sy’s costar is Charlotte Gainsbourg who has won a Cesar Award too. They really make a great duo in Samba. Samba Cisse is African immigrant living in France and has been there for ten years while staying with his uncle. He’s a perfect immigrant: has a job, training to be a chef, and keeps out of trouble. He is stopped at an immigration checkpoint to learn that his application for residence has been denied. Samba is detained and questioned by one immigration attorney, Manu (Izia who is well known rock singer in France) and her legal aide, Alice. Alice and Samba become very close, and become closer when he loses his case to become a resident. Hi uncle gives his residency card for Samba to get work. Samba must keep a low profile because he is always one step away from getting caught by the police and being sent back home. Samba is an extremely powerful film about one man’s struggle for trying to live in country where Immigration is often illegal and the reclusive policies are against you. Sy’s performance was the best part of the film. He was funny, charming, and made you really root for him. He and Gainsbourg had great chemistry and their relationship made Samba really enjoyable to watch. The film is in French and has that French sexually vibe to it. There is one scene between Sy and Gainsbourg where Samba is massaging Alice and it is shot in a very sexual way. The cinematography of the scene leads the audience to believe that they will have an intimate moment. There are moments like that in the film and it is one of the ways how French films differentiate between America films. There are criticism about Samba specially immigration policy should have had more of a role. The story is kind of bland. Personally, there should have been more emphasis on process of the French immigration policy. Samba’s application was decline but the audience never finds out why. He’s a hard worker and has been a productive member of society for ten years. One can assume that he was turned away because he was African. The story would have benefited with inclusion of Samba’s legal battles against the policies of France’s Immigration Policy. It would have added that much needed tension that film needed at times. Samba is a good film overall. It is very enjoyable and the performances by the actors really make it enjoyable. Sy and Gainsbourg did deserve acting awards. Samba gets 3.5 for having acting performances, theme, and overall quality of the film. 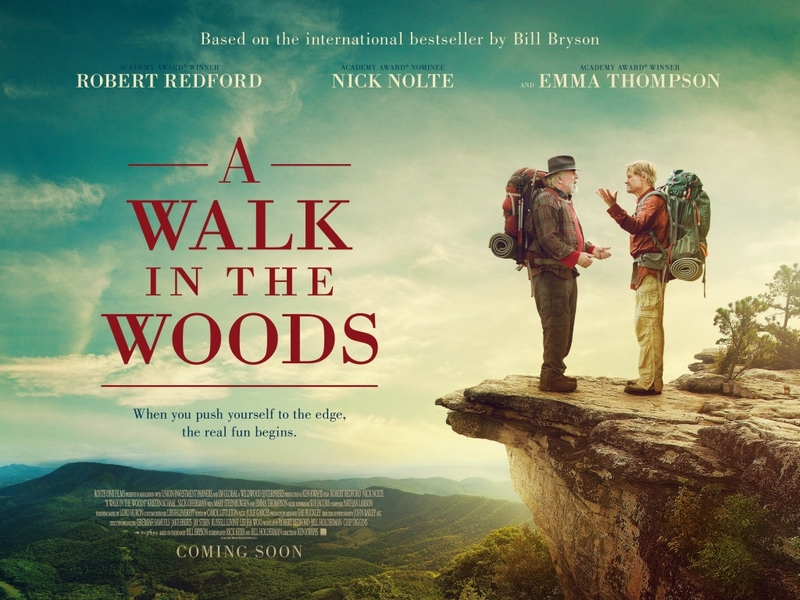 A Walk in the Woods is a film based off the book called A Walk in the Woods by Bill Bryson. Bill Bryson is a well-known author in the world. His book generally deal with traveling to other countries in the world. Bryson decides that he wants to hike the Appalachian Trail, and his old friend, Stephan Katz, joins him. Bryson wrote a book about the expedition. Robert Redford, who was a fan of the book, brought the rights to adapt into a movie. He originally wanted his good friend Paul Newman to play Stephen but Newman’s untimely death laid that dream to rest. Nick Nolte was chosen to play Stephen. His character is a take on Nolte’s life. A Walk in the Woods is directed Ken Kwapis and written by Rich Kerb and Bill Holdermann. The movie is fairly hilarious but kind of does a 360 during the third act. Bill Bryson, Robert Redford, is living in the United States with his wife, Catherine Bryson (Emma Thompson). They’re living New Hampshire and have a comfortable life. The couple attends a funeral, and Bryson decided to take a walk to gather his thoughts only to stumble onto the Appalachian Trail. He becomes interested in the history and scenery of the Appalachian Trail. He decides that he wants to hike the 2,000 mile trail but Catherine objects. She only agrees if he takes someone with him. Bryson calls up his old friends which they all decline besides Stephen Katz. He is a longtime friend who Bryson hasn’t seen for years. The two men hike the Appalachian Trail together and begin to reconnect their long lost friendship. A Walk in the Woods is overall a good movie; however, the film in the last act changes its tone from humorous to serious. Bryson and Katz are late middle age men who have lived separate lives. Bryson got married, had kids, has grandkids, taught at universities, and is a successful author while Katz is completely opposite. Katz and Bryson both start to question their lives and ask each other existential questions at end of the movie. These questions shift the tone from comedy to drama and took the adventure out of the movie. Although on a five month hike with a partner, these questions would be contemplated by the people on the trip. The dialogue took the fun out of the movie which is why it’s a negative point. The strongest point of the film is the chemistry between Robert Redford and Nick Nolte. A Walk in the Woods is memorable because the scenery within the film is so breathtaking. However, the best part of the film is the interaction between Redford and Nolte. Redford is actually quite funny when the movie starts. The interview scene with Redford’s character at the very beginning of the movie is the best scene with him. The movie takes off with the scenes with Nolte and Redford. The banter and scenes between the two actors make the movie flow. The audience felt like Redford and Nolte were longtime friends that are reconnecting. There is one scene when Redford and Nolte say in a hotel in Tennessee. Nolte does their laundry and is seduced by a woman. Redford is eating at their hotel restaurant when Nolte comes sneaking in saying that he was being chased by the husband of the woman that he was messing with. The two keep exchanging quips and eventually get out of danger. The two actors could work together again because it is a duo that is comparable to Mel Gibson and Danny Glover from Lethal Weapon. Overall a Walk in the Woods is a great comedy film. The performances are to die for because Redford and Nolte deliver a lot of comedy. Nolte might have a career resurgence because he stole the movie. A Walk in the Woods would have been one of my favorite films of the year but the ending is a letdown.